Various soccer fan group members spoke up against government’s latest plans to ban political cheering in stadiums across Turkey. Considering the measures as an extension of AKP government’s ban mentality, Tek Yumruk and Sol Açık groups predict that soccer fans are very likely to use humor in the days to come. Bianet interviewed soccer fan groups Tek Yumruk and Sol Açık on the government’s plan to take measures against political cheering – a claim that Interior Minister Muammer Güler formulated as combating “anti-sportsman behavior and cheering”. 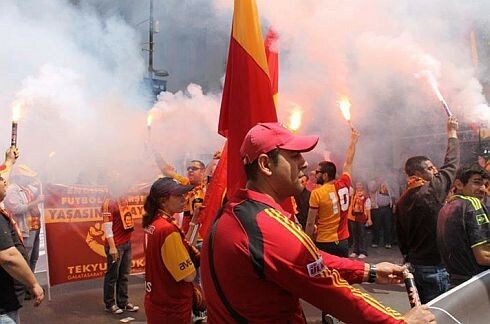 Tek Yumruk and Sol Açık, prominent fan groups from Galatasaray and Fenerbahçe Soccer clubs respectively, said they contested the bans which they predicted will be violated through new methods. 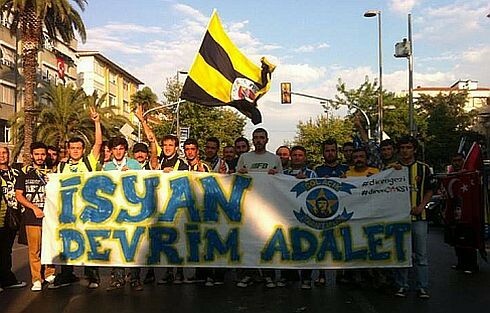 This entry was posted in News, Protests in Turkey and tagged Gezi Resistance, government ban of slogans, Istanbul United, Soccer Fans, Sports and politics, Ultras on 2 August 2013 .